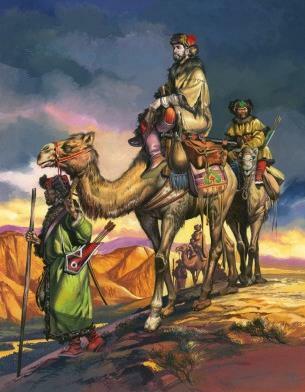 The story of Marco Polo and his companions is one of the most romantic and interesting of mediaeval or of modern times. The manner of the return of the Polos long after they ad been given up for dead, the subsequent adventures of Marco Polo, the incredulity with which his book of travels was received, the gradual and slow confirmations of the truth of his reports as later explorations penetrated the mysterious Orient, and the fact that he may be justly regarded as the founder of the geography of Asia, have all combined to give to his narrative a certain fascination, with which no other story of travel has been invested. 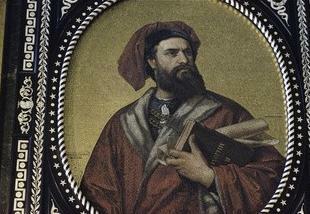 At first read for pure amusement, Marco Polo’s book eventually became an authoritative account of regions of the earth which were almost wholly unknown to Europe up to his time, and some portions of which even now remain unexplored by Western travelers. he had a very study physique. Marco, who took after his outgoing and adventurous father, embraced the newness he discovered along his journey, related to people as equals, and survived strenuous travels, violence, illness and inclement weather that would have stopped other men in their tracks and sent them packing back home (several of their traveling companions did just that, others perished!). 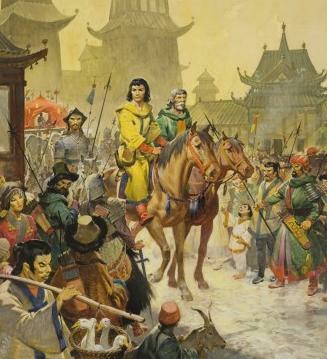 When you see representations of Marco Polo, none made during his lifetime, you see a sturdy hulk of a man whom today we would say looks like a rugby player, or an adventurer. This physique seems the most likely. Only later, when Marco's story was reprinted and illustrated for a mass audience, was his likeness changed into a romanticized waif. 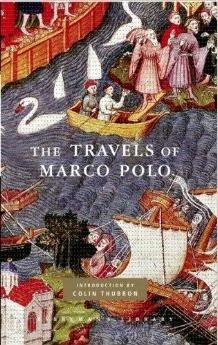 I have links below to free on-line copies of Marco Polo's book. You'll find that the footnotes added by the translator to each chapter are much longer than Marco's chapters, and they provide fascinating information. Marco's book begins with a prologue that offers an overview of his father and uncle's travels, and his own travels with them and on his own. After that, he discusses places he visited, one at a time, over the two books. Here is a an excerpt from later in the books, where Marco describes Kublai Khan and his four wives. The personal appearance of the Great Kaan, Lord of Lords, whose name is Cublay, is such as I shall now tell you. He is of a good stature, neither tall nor short, but of a middle height. He has a becoming amount of flesh, and is very shapely in all his limbs. His complexion is white and red, the eyes black and fine, the nose well formed and well set on. He has four wives, whom he retains permanently as his legitimate consorts; and the eldest of his sons by those four wives ought by rights to be emperor;--I mean when his father dies. Those four ladies are called empresses, but each is distinguished also by her proper name. And each of them has a special court of her own, very grand and ample; no one of them having fewer than 300 fair and charming damsels. They have also many pages and eunuchs, and a number of other attendants of both sexes; so that each of these ladies has not less than 10,000 persons attached to her court. Marco's commentary, dictated to his transcriber while in a prison in Genoa, Italy, is just as an Italian would speak to you. Many of the phrases begin with "You should know..." which in Italian is "Devi sapere...", a common way of beginning an explanation of something to someone. The text is very colloquial, just as if Marco were sitting there speaking to you. Marco explains that he learned so much about the lives of the peoples he visited, because he wanted to entertain the Khan with the details when he returned from his missions. Marco had noticed that the other ambassadors disappointed the Khan by their dry and spare accounts of their journeys, so Marco kept notebooks as he traveled, noting down things the Khan might not know. He brought these notebooks home with him, and sent for them from prison, and referred to these notebooks as he dictated his story. 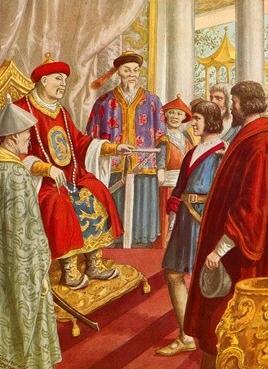 Please visit Italophiles.com (Candida Martinelli's Italophile Site), my Italian culture site, to read on my Marco Polo page an entertaining summary of the voyages of the Polo men, of how Marco came to write the book, and excerpts from Marco Polo's book. Free e-book versions are available from Project Gutenberg, the grand-daddy of all free e-book websites. Here are two videos from YouTube promoting two TV-films of varying quality about Marco Polo.